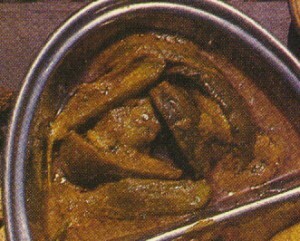 Bhagaray Baingan recipe by Bano at DesiRecipes.com. Fry separately the sesame seeds , peanuts, cumin and methi seeds and grind them separately to a powder. Now add coconut and mix well. Cut onion into small pieces and green chilies into two halves. Take a pan, pour 3 tsp of oil and put green chilies. Then put onions, fry them well till it changes its color to golden brown. Now put mint and fry for a few seconds and turn off the stove. After it cools, put them in a grinder, add ginger garlic paste, little turmeric powder, red chili powder, salt , sesame seed powder and grind them into a thick paste. If required add a little bit of water. Remove it and keep it aside. Make 4 slits vertically for each baingan (do not cut it completely). Keep them in microwave for 3 to 4 minutes and remove them. Take a pan pour 2 tbsp of oil and put baingan and fry them for few minutes. Then add the onion masala paste and mix well, see that baingan does not break. When it is well cooked add tamarind water, mix them and let it cook for another 6-7 minutes.